Xactly was recently named a Leader by Gartner Inc. in the 2019 Magic Quadrant for Sales Performance Management (SPM). This recognition underscores the platform’s unique ability to drive sales performance improvements for its customers and the company’s commitment to broadening its product offering to meet evolving market needs. This is the sixth time that Xactly has been named a leader. The company’s SPM Suite of products enables sales and finance executives to design, implement, manage, audit and optimize sales compensation management programs easily and affordably. Xactly’s solutions automate the process of aggregating data from disparate systems into a secure, hosted repository, and enable companies to leverage this business data, which is the lifeblood of sales performance management. Xactly helps companies improve operational performance, optimize sales effectiveness, proactively manage risk and compliance, and maximize profits. 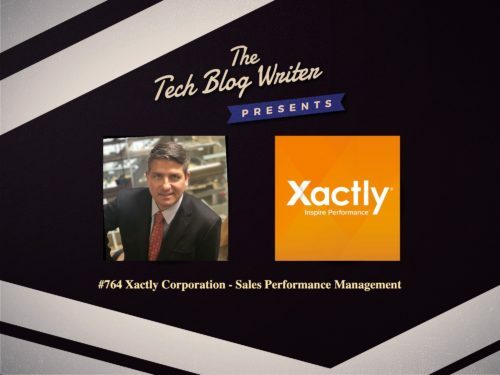 The Xactly family of products is used by sales and finance executives, compensation analysts, sales operations and sales professionals across a variety of industries, ranging from SMBs to large enterprises. When I also learned that their SPM software is used by some big brands, like Salesforce, Hyatt Hotels, and Louis Vuitton, I thought it was time to get them on my daily tech podcast. Today’s guest is Christopher Cabrera, Founder, and CEO of the Xactly Corporation. Chris is also the author of Game The Plan (River Grove Books, 2014) and co-author of Xactly Sales Compensation for Dummies (Wiley Publishing, 2006), as well as a contributing writer to such industry publications as Inc.com, Selling Power Magazine, and destinationCRM. Prior to founding Xactly, was SVP of operations for Callidus Software, an on-premise sales incentive compensation automation company. At Callidus, responsible for worldwide sales and marketing strategies, customer advocacy, and strategic alliances. Responsible for acquiring more than 100 customers, growing annual revenues from zero to $100M and a successful IPO in 2003 raising more than $70M.